The Zulu, a large ethnic group in SOUTH AFRICA, are based in Natal Province on the country’s eastern coast. They speak a BANTU language closely related to that of the XHOSA. Originally one of many small societies in the region, the Zulu grew into a powerful nation in the 1800s. Traditionally the Zulu were farmers, growing millet, a kind of grain. In addition, the men tended large herds of cattle, which were an important sign of wealth. In the early 1800s a leader named SHAKA ZULU united the Zulu and other neighboring peoples into a well-organized state that dominated the region. Later, European settlers took over much of the Zulu grazing land, causing the great herds to shrink. 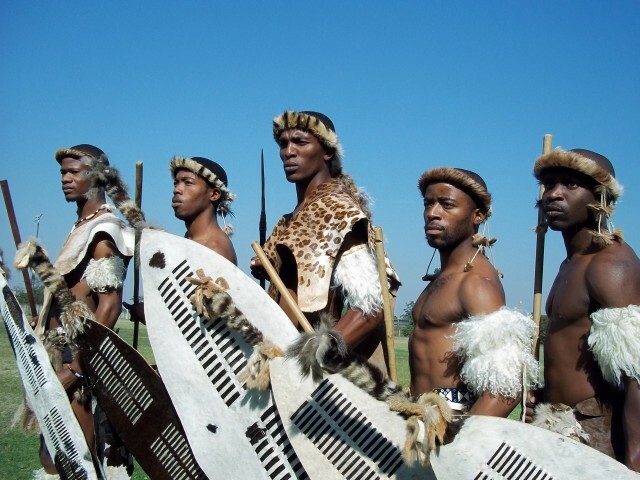 The modern Zulu have retained many of the traditional features of their society. In the settlements of KwaZulu in Natal, villages are organized around a hierarchy made up of older men who serve under the king as clan chiefs and the heads of clan sections. First created by Shaka Zulu, this form of organization is reflected in the Zulu-based Inkatha Freedom Party, which was involved in the movement to end apartheid in South Africa.